On the west coast of Antigua, The Water’s Edge is a luxurious and spacious beachfront villa located at the end of North Beach in Jolly Harbour. Boasting an array of outdoor living areas including an infinity pool, a rooftop bar and its own beach at the entrance to the marina, this exceptional villa also has an extensive deck with mooring for a yacht. The property tumbles onto soft white sands and the sparkling turquoise Caribbean Sea laps at its shore. 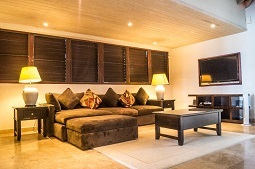 The Water’s Edge has four elegantly designed en-suite bedrooms, three of which have large showers, fully tiled travertine bathrooms and their own private patio area. The Master bedroom has a full sized bath and a double shower unit. All bedrooms have walk-in wardrobes, are fully air-conditioned and also have ceiling fans. With its high vaulted wooden ceilings, the property has a bright and airy sense of space, accentuated by the floor to ceiling folding glass doors in the living room. 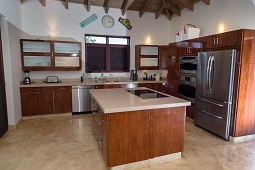 The modern spacious kitchen is fully equipped and has stainless steel appliances throughout. The main living area is large and open plan, perfect for entertaining, with a dining section and two lounge areas, one looking out to the ocean and the other, a TV area cozily tucked away. The large patio has a BBQ and Jacuzzi/hot tub as well as an infinity pool. There is plenty of space to lay back and enjoy a lazy day in the sun, whilst listening to the waves softly rolling in beside you. 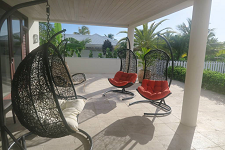 Optimally designed for relaxed and enjoyable Caribbean living, this villa is also a sunset lovers paradise with many spots where you can enjoy the best sunset on the island, every single evening.